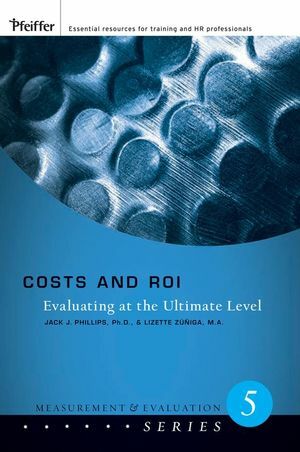 Costs and ROI is the fifth of six books in the Measurement and Evaluation Series from Pfeiffer. The proven ROI Methodology--developed by the ROI Institute--provides a practical system for evaluation planning, data collection, data analysis, and reporting. All six books in the series offer the latest tools, most current research, and practical advice for measuring ROI in a variety of settings. All costs must be captured for an accurate cost profile. Costs and ROI focuses on developing program costs and the ROI and explains this vital element in the ROI Methodology. The authors show how to capture all costs in order to bring credibility to the analysis. 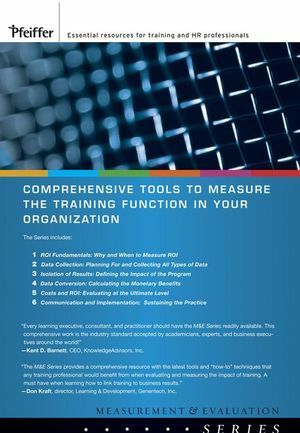 The book outlines the actual ROI calculation and explains the many assumptions and issues that must be considered when calculating the ROI. Costs and ROI presents three effective calculations: the benefit-cost ratio, the ROI percentage, and the payback period. Costs and ROI includes all the challenges and concerns regarding the use of ROI. 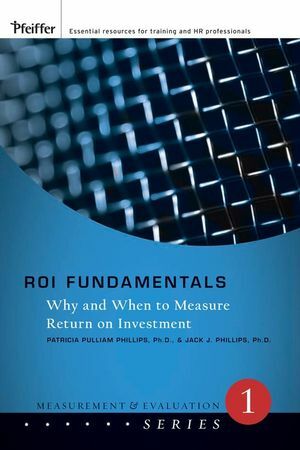 Jack J. Phillips is chairman of the ROI Institute, Inc. A world-renowned expert on measurement and evaluation, Phillips provides consulting services to Fortune 500 companies and workshops for major conference providers throughout the world. Phillips is the author or editor of more than thirty books and more than one hundred articles. Lizette Zúñiga is senior consultant with the ROI Institute, Inc., and CEO of LCZ Integrated Solutions, Inc., a research and consulting firm focused on organizational improvement and accountability. With more than fifteen years of professional experience, Zúñiga has expertise in leadership and team development, conflict resolution, diversity training, organizational culture assessment, merger integration, strategic planning, program evaluation, ROI, survey design, and needs assessment. The ROI Institute, Inc., is a benchmarking, research, and information sharing organization that provides consulting services, workshops, and certification in the ROI Methodology. Widely considered the leading authority on evaluation and measurement of learning and development in organizations, the ROI Institute conducts workshops and offers certification for thousands of practitioners through a variety of strategic partners. 1. The Importance of Costs and ROI. Why Be Concerned About Costs? Other Reasons for Monitoring Costs. The Ultimate Level of Evaluation. The "Show Me" Generation . The New Definition of Value. Staff Support Managers' New Business Focus. Executive Appetite for Evaluation of ROI. 2. Cost Tracking and Classification. Pressure to Disclose All Costs. Fully Loaded Costs as a Conservative Approach. The Danger of Accumulating Costs Without Tracking Benefits. Facilitators' and Coordinators' Salaries and Benefits. Case Study: Federal Information Agency. Basic Issues in Calculating ROI. Example 1: Retail Merchandising Company. Example 2: Global Financial Services. Example 4: Metro Transit Authority. ROI, the Profit Center, and EVA. ROI Can Be Very Large. What Happens When the ROI Is Negative? ROI Is Not for Every Program. Take a Conservative Approach When Developing Benefits and Costs. Make Sure That ROI of Programs Is Not Confused with Other Financial Measures of Return. Involve Management in Calculating ROI. 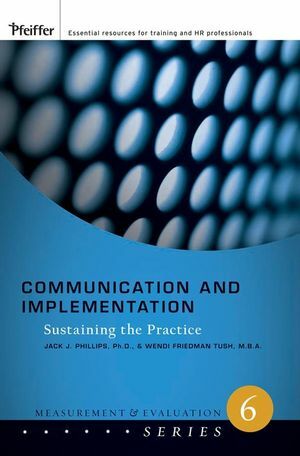 Fully Disclose Assumptions and Methodology. Approach Sensitive and Controversial Issues with Caution. Teach Others the Methods for Calculating ROI. Recognize That Not Everyone Will Buy into ROI. Do Not Boast About a High Return. Choose the Place for Debates. Do Not Try to Use ROI to Evaluate Every Program. ROI Is Too Complex for Most Users. ROI Is Expensive, Consuming Too Many Critical Resources. If Senior Management Does Not Require ROI, There Is No Need to Pursue It. ROI Is a Passing Fad. ROI Is Only One Type of Data. ROI Is Not Future-Oriented; It Reflects Only Past Performance. ROI Is Rarely Used by Organizations. The ROI Methodology Cannot Be Easily Replicated. The ROI Methodology Is Not a Credible Process; It Is Too Subjective. ROI Cannot Be Evaluated for Soft-Skill Programs; It Is Only for Production and Sales. ROI Is Only for Manufacturing and Service Organizations. It Is Not Always Possible to Isolate the Effects of a Program. Measurement of On-the-Job Activities Is Impossible Because Post-Program Control of Participants Is Impossible. ROI Is Appropriate Only for Large Organizations. The ROI Methodology Has No Standards. Case Study: Retail Merchandise Company-Part A: Pre-Program ROI Forecasting. ROI Forecast with a Pilot Program. ROI Forecast with Reaction Data. Case Study: Retail Merchandise Company-Part B: Level 1 ROI Forecasting. ROI Forecast with Learning Data. Case Study: Retail Merchandise Company? Part C: Level 2 ROI Forecasting. ROI Forecast with Application Data. Case Study: Retail Merchandise Company? Part D: Level 3 ROI Forecasting. If You Must Forecast, Forecast Frequently. Consider Forecasting an Essential Evaluation Tool. Forecast Different Types of Data. Secure Input from Those Who Know the Process Best. Understand That Long-Term Forecasts Will Usually Be Inaccurate. Expect Forecasts to Be Biased. Commit to the Hard Work of Serious Forecasting. Routinely Review the Success of Forecasting. Be Aware That Assumptions Are the Most Serious Errors in Forecasting. Keep in Mind That Decision Making Is the Purpose of Forecasting.